Paige Dolecki - Stampologist: Video Tutorial - CTMH Page Protectors in your Creative Memories Albums + Work the Workshop! Video Tutorial - CTMH Page Protectors in your Creative Memories Albums + Work the Workshop! Close to my Heart recently took over the Creative Memories business relationships with its consultants in Australia and New Zealand. Once again CTMH showed what a great company it is by covering a lot of the contractual items that were affecting both consultants and customers with the unfortunate bankruptcy of Creative Memories in those territories. We are thrilled to welcome our creative sisters down under! One of my Aussie CTMH sisters put together a terrific video tutorial showing how to convert CTMH page protectors to work in the Creative Memories albums. As I have a recent new customer who is a former Creative Memories client, I'm posting this here for her and others who are looking for new solutions to their older albums. **If you are getting this delivered via e-mail, you'll need to click out to my blog in order to see this informative video! Keep in mind, the AU pricing is slightly different so when she talks about the dollar cost of the page protectors, in the US we pay $22.95 for a set of 50 bulk page protectors. Ready to purchase some for your albums? Contact me at Paige@Stampologist.com or CLICK HERE to shop directly on my website! 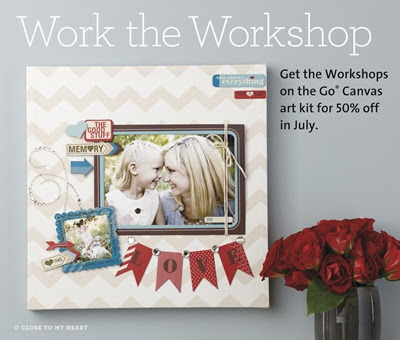 Don't forget our Work the Workshop special is going on until July 31st and you can get our fabulous Canvas Home Decor kit for just $19.95! I've been busy working on my new Facebook business page - learning a lot of things about doing business out there and posting some fun things as well! Want to win a $35 gift card to Target? Visit my business page by clicking here for my post about the next Big Picture Class Pajama Party and find out how! While you are out there give my page a Like, 'cause its always nice to be liked! I'll be using my business page for lots of new activities like giveaways and specials so if you like to be in-the-know then be sure to hover over the "Like" button until your settings pop up. Once they do, click settings and the click "all notifications". That way you won't miss any of the fun artwork or surprises I post out there! Thanks for posting this, Paige I have one customer in particular that will benefit from this instruction! You are welcome! I hope your customer finds it useful!